St Francis Rangers boss Simon Boddie said football is cruel after his side lost 4-3 at Storrington. Rangers squad was thin, with Boddie only being able to name two substitutes. Boddie's men would have been confident with their only win coming in the reverse fixture earlier in the season. Rangers piled on the early pressure but were completely caught asleep in our back line and were 1-0 down against the run of play. The game was quite exciting end to end but again Rangers relaxed at the wrong time and found themselves 2-0 down after 31 minutes. However the final 15 minutes saw Rangers keep at the Swans and Rhys White who was having a great game eventually scored, closely followed by the equaliser from a well worked move finished by Adrian Spence. But the drama wasn’t over on 40 min there was an off the ball incident which saw the Storrington number six lying on the floor. 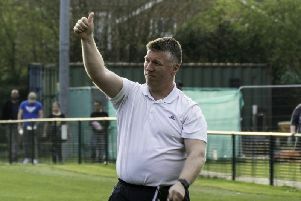 The referee had seen the incident and taking his time he eventually booked the opposition player but sent off Adrian Spence. A few minutes later it was half time. Boddie said: “We reorganised in the dressing room and came out raring to go for the second half. Despite this, the 10 players of Rangers really were holding their own and battled every ball, tackle and sprint. However the Swans then had scored a fourth and it seemed all over for Rangers. But with five minutes left White got his second and Rangers’ third. Rangers worked really hard and had chances to equalise but it wasn’t to be. Boddie said: “Football is cruel but we all know that and that is why we love the game, Saturday we really did not deserve the hand that the cards dealt. “It’s still another loss but as the manager I was extremely pleased with the the players and it’s now down to me to lift their spirits to face another hard game at home Saturday against Langney Wanderers."